This is Part 2 of a __-part series called "Dear Church". I am not going to lie to you. Planning worship is hard. So many elements have to fit together just right to create a music set that takes a congregant on a journey into an awareness of God's presence. I always laugh (and sometimes cringe) when someone talks about a worship leader "leading them into God's presence" or "leading them to the throne". No one has that ability. Bob Kauflin, in his book Worship Matters [affiliate link] states that the only thing that mitigates the presence of God is the blood of Christ. All that I, as a worship leader, can do is lead someone into an awareness of God's presence and provide a voice to (a) celebrate who He is and what He has done, and (b) respond with their hearts. I always felt aimless in my approach to planning songs for congregational singing until I heard a sermon by David Dykes at Green Acres Baptist in Tyler, TX, in which he outlined a theology of worship planning that I have tried to implement ever since. This phrase literally means "Let the message about Christ..." Christian worship should be rooted in and founded on the Gospel. Our basis of approaching the throne of God is the blood of Christ, shed for us on the cross. We would do well to remember this and keep the Gospel of Jesus Christ at the heart of our worship. As worship leaders, we must lead our people to treasure the Word of God. The Scriptures tell God's story of redemption from the beginning of time. Have you ever noticed that you can remember lyrics of songs you heard many years ago? We would do well to remember this and choose music that helps the people we lead to treasure (hide) the Word in their hearts. There is just as much value in horizontal (to each other) expressions of worship and praise as in vertical (to God). In the horizontal expressions, we remind ourselves and our friends of who God is and what He has done. As worship leaders, we would do well to give our people a voice to remind one another of the Gospel and encourage one another to view our lives--our joy and struggles--through the lens of the Gospel. The psalms are songs to God and about God. They cover a vast range of topics, from the greatness and majesty of God, to the importance of singing. From honesty with God in hard times to assurance of God's unfailing love. There is a wide range of emotion expressed in the psalms: Joy, sorrow, fear, pain, confidence, dependence. It is in the psalms that we see that are free to be honest with God about our feelings and not feel the need to "put on a happy face". King David, who is remembered as a man after God's own heart, was one of the biggest complainers in the Bible. He was honest with God and God honored him for it. We would do well to lead our people in honesty and authenticity, and let them know that it is okay to be honest with God. He can handle it. Psalms are not always easy to sing. There are some great songs in the church's quiver that use psalms as the text. A few weeks ago, I adapted and set Psalm 100 to music. Click here to see the video. 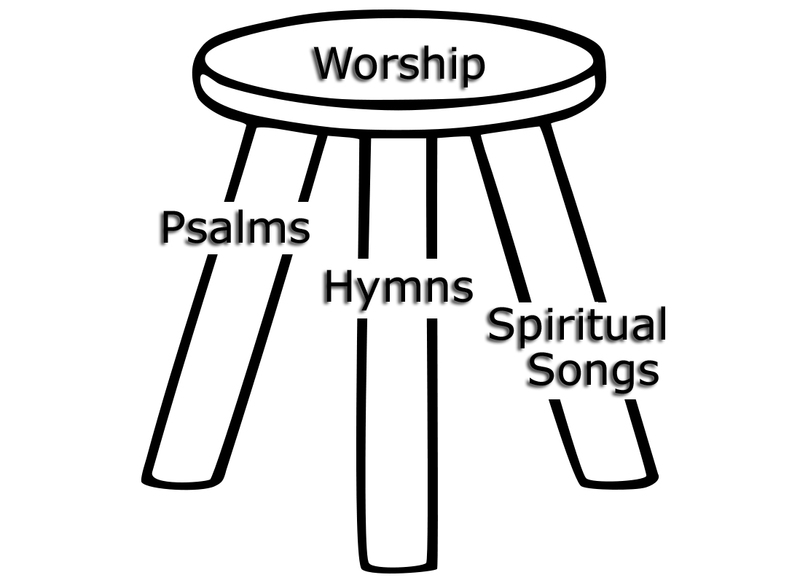 There are other creative ways to incorporate the psalms into the service of worship. The point is not that you have to sing the psalms. The point here is that there needs to be an element from the psalms in our services. The capitalization of the word "Spirit" in this translation implies God's Holy Spirit. He puts a song in our heart when we turn our attention and affection towards Him. We can, in turn, encourage one another with those songs. Other translations use the phrase "spiritual songs" which might imply any song from our spirit as a song of affection or response. These songs do not follow rigid musical forms. They are more free-flowing and spontaneous. As worship leaders, we would do well to allow time in our services and gently lead our people to sing from their spirits as the Spirit gives a song. These can be very beautiful and meaningful times in our worship meetings. It may sound chaotic to some, but God hears every part. 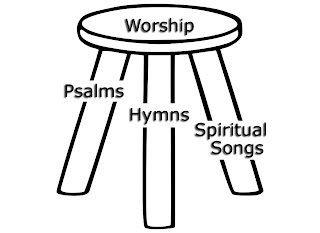 In conclusion, I like to think about these elements as legs of a stool. I would submit that they are of equal importance to the strength of a church's worship expression. You wouldn't want one of the legs to be longer or shorter than the others or the stool wouldn't be a comfortable and useful piece of furniture. Over to you. How do you approach the planning of songs for your congregation? Have you considered the Colossians 3:16 approach?